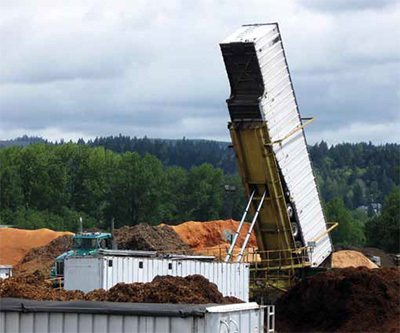 Swanson Bark and Wood, out of Longview, Wash., turns waste wood into mulch, firewood, soils and biomass. Blair Standin, owner of Precision Forestry, may be young, but knows how to run a productive, 21st century operation. Scott Shaeffer and Kris Williams operate a customized small-scale sawmill, Wilfer Mobile Sawmill, in Colorado’s devastated forests. The Renner family began as farmers, but transitioned into trees, creating a diversified California business. as a big recycler with a focus on wood. 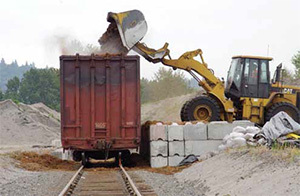 As the economy slowly pulls itself out of a deep slump, and shuttered mills (or mills operating at reduced levels) begin the tedious regulatory process of re-opening or expanding, post-harvest forestry support services that are already in place will play a vital part in the future success of those mills. Companies that have existing, difficult-to-permit infrastructure can, and do, enable mills throughout Washington and Oregon to operate. 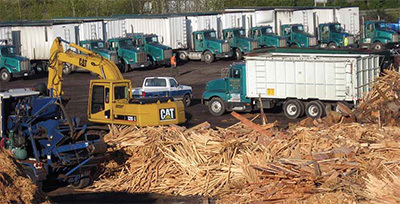 Companies such as Swanson Bark and Wood Products in Longview, Wash., provide services that are nearly impossible to acquire economically on a mill-by-mill basis but, at the same time, are services required by regulatory agencies for the successful pursuit of permits to operate. Without companies like Swanson, the comeback of the forest products industry might be more of a dream than a reality. Swanson Bark and Wood turns waste wood into firewood, mulch, soils and biomass. While that description might be technically accurate, SB&W is much more than just a big wood recycling business to the companies with whom the firm deals. 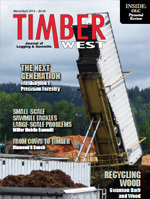 As a wood products processor, Leber says Swanson Bark and Wood accepts millions of pounds of material, “whether it’s bark or log chunks or chips or whatever,” from a variety of sources in the region, especially sawmills and other wood processing operations. Material that might be difficult and extremely expensive to dispose of or treat as waste produced by an individual operation becomes a resource in the hands of Swanson Bark. Based on the amount of conversation regarding biomass, it seems “waste” wood should be a “hot” commodity in short supply, but the immense barriers entering the business of wood waste disposal make the proposition sound a lot better than it is. 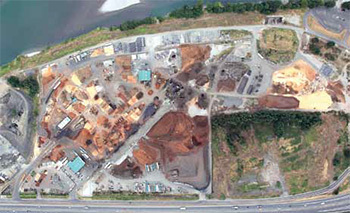 Currently, Swanson Bark operates a 68-acre yard in Longview and still owns the company’s original location, a second yard on Talley Way in Kelso, to provide for reserve capacity. 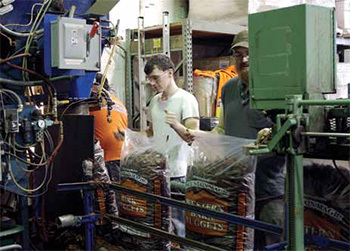 Grinders, large and small, are a key part of a bark and wood processing operation.Swanson uses both Peterson and Morbark grinders. The two Peterson 4710s are portable and both are wheeled and tracked because it makes them handier, even on Swanson’s all-paved property. The Morbark grinders are used for stationary situations. Demonstrating the flair for innovation that has made John a success in a challenging industry, he says that in the future he would like to try track machines with a small diesel power plant to move them around and, as he describes it, use a giant umbilical cord to plug into electric. According to John, combining the mobility of a tracked machine with the reduced maintenance and fuel costs of electrically powered grinders should enhance both productivity and profitability. For wood, Swanson uses primarily BM&M screens made in Surrey, British Columbia. For rock, however, the company uses CEC screens because they are made nearby, and there is never much downtime for parts delivery. Swanson also operates a large fleet of trucks for both pickup and delivery. Because the trucks operate all day, every day, John prefers Kenworth because of the durability of the vehicles and for parts consistency. Right now, John says, Swanson stocks its own maintenance and repair parts, but Kenworth recently opened a store nearby, so the firm is looking into the possibility of reducing its stocked parts inventory. Employees bag up product that will be shipped out on Swanson’s large fleet of trucks. Swanson has shown itself to be an innovator with staying power. By way of example, Swanson recently partnered with Rooflite, the only FLL Certified Green Roof Growing Media available in North America. Rooflite, manufactured with material from Swanson’s plant, has been successfully used on a variety of projects including a 12,000 square foot roof in Tacoma on the Center for Urban Waters building and a 26-story building in downtown Seattle. Swanson is also looking to expand its market reach. In 2010, the firm added a rail spur to its Longview facility to increase its capability to ship product throughout the United States. Expanding, even in a down economy, Swanson Bark and Wood Products is positioning itself as a national leader in the use, reuse, and repurposing of wood.